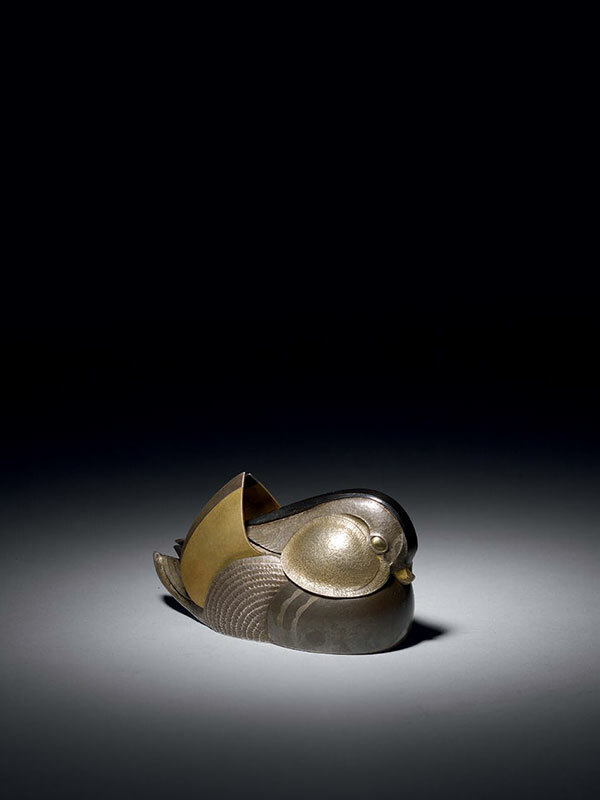 A small metal kogo (box) in the form of a Mandarin duck. The bird is sitting on a flat base with typical upturned wings and a short tail. The head of the duck forms the removable cover of the box, which is held in place by a locator pin. The interior of the kogo is fitted with a removable liner. The slightly recessed base is engraved with the signature of Unno Takeo. The kogo is contained within the original wood tomobako, which is inscribed Oshidori, Takeo saku, with the seal Takeo (Oshidori bird, made by Takeo, with the seal Takeo). Oshidori (Mandarin ducks) are generally portrayed as a symbol of conjugal love and fidelity. They mate and pair for life. In Chinese and Japanese paintings, they are often swimming harmoniously, regardless of whether the water is calm or choppy. Oshidori themed objects are often given as wedding gifts. The artist who made this wonderful, life-like Mandarin duck kogo is Unno Takeo (1905 – 1982), son of the metal artist Unno Bissei and nephew of Unno Shomin. He graduated from the Tokyo School of Fine Arts in 1928 and afterwards exhibited frequently at government-sponsored art exhibitions such as the Teiten and the Shin-Bunten. After the Pacific War he returned to the national exhibitions, the Nitten, where he also served as jury member seven times. The organisers of the Nitten, the Japan Arts Academy, the highest-ranking artistic organisation in Japan, honoured him for his work.